Get in the spirit of the season at Garden Street Academy’s annual Holiday Boutique on Saturday, December 1st from 10 am to 2 pm. It will be held on the school campus at 2300 Garden Street in Santa Barbara. The event is free, open to the public and a family-friendly affair. 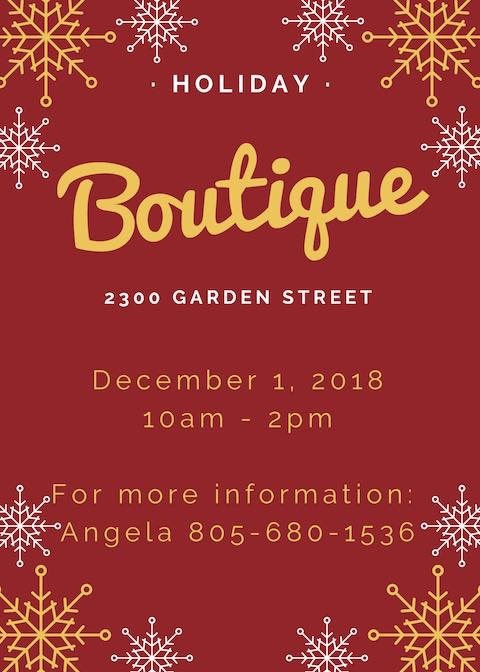 The boutique will feature several unique vendors with a wide variety of holiday gifts, a Christmas tree raffle, and holiday treats. Enjoy the sights and sounds of the holiday spirit while you shop in the festively decorated hall. Shoppers will find a huge selection of beautiful and one-of-a-kind handmade items including jewelry, essential oils, succulents and much more. In addition to local artisans, vendors will also be on-site featuring items from LuLaRoe, Paparazzi Jewelry, Pampered Chef, Mary Kay, and Arbonne. Carolers will be singing your favorite holiday music and the boutique will offer coffee, hot chocolate and fresh-made pastries for purchase. Proceeds from the event will benefit the Garden Street Academy Scholarship Fund, which promotes the school’s vision to offer a progressive independent school experience to families who might not otherwise have the opportunity.